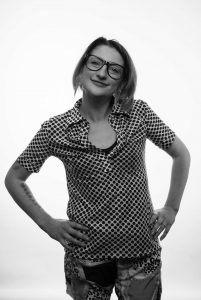 Hi, my name is Georgia Bell, and whilst I’m either no industry star or name that you may not recognise, YET :), I jumped at the chance to share with you on How To Cut It my adventure and passion for hairdressing – along with some of my most recent standout moments I’ve currently experienced. I always thought that owning my own salon would be enough, however that was until I started entering industry competitions. After 9 months of opening my salon I decided to enter a competition run by the hair product manufacturer Affinage who were looking to find Colour Rebel’s for their brand. The initial brief to entering was simple: to submit 5 different photographed looks you had created. Fab, I entered! I was then really pleased to be selected down to the final 12, and off I went to Affinage HQ to showcase a colour and style that I had created in a 5 minute presentation in front of a distinct panel of judges, which include Tracey Divine Smith – a hairstylist I’ve long admired and followed throughout my career. Unfortunately, I didn’t place for the final 6, but it was a fantastic experience that I loved. That was it, I was now hooked on the buzz of entering industry competitions and wanted more. Some weeks later I then heard of another competition being run on Instagram called Redken City Beats. The requirement was simple: to create a colour on a model and upload the image. A panel of Redken judges would then select their favourite 9 images and whichever image got the most Instagram votes was the winner. Hundreds of cool images were submitted, so I wasn’t too hopeful. But after 3 weeks I received a message to say one of my images had been selected! 3 more days of voting on the finalists looks began and although I didn’t win, my image was placed as runner up which I was really pleased about. 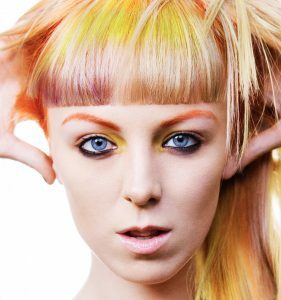 The more creative hair and colour I was doing, the more my passion and interest into this side of the hairdressing world began to grow. I then started listening to the How To Cut It Podcast Show by Dom Lehane, and I loved listening to everyone’s stories about the industry. The more I listened to what was being said, the more I wanted to see what hairdressing was like in the fashion capital of London. One salon in particular stood out to me and has been really influential to me since opening … that was Not Another Salon. I remember saying to my partner at the beginning of last year if I wasn’t a salon owner I’d love to work there. 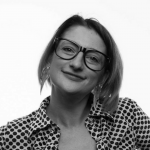 It was then after listening to Sophia Hilton’s podcast interview with Dom that I finally decided to write to her, asking if I could come and assist the team on a voluntary basis. I said I would do anything from sweeping the salon floor to shampooing. I just wanted I the chance to stand on and watch so I could improve my skill set. Much to my amazement Sophia wrote back and said, yes! Initially it was for 3 weeks but I got on with everyone and I’ve ended up sticking around. I still travel to London every Wednesday to help out and I’m very lucky to have been asked to help out on the colour courses for the academy starting in May 2018 –something I’m really excited about. 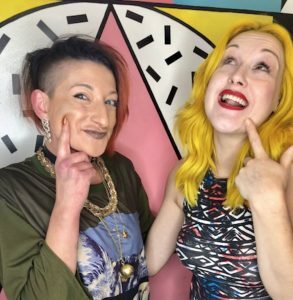 Shortly after starting my assistant position at Not Another Salon, the bright colours I was smashing out of my salon was getting noticed, and I was then approached for sponsorship by colour brand Manic Panic. I couldn’t quite believe it! I was over the moon that a brand had taken notice of what I was creating and had offered me a helping hand. All the bright and vivid colour work I create now is done by using the Manic Panic colours. I love it!! They are a great brand to be part of and I’m really proud to be just one of the 5 UK based sponsered stylists. 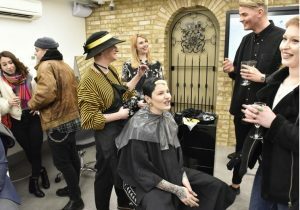 Most recently I was offered my first opportunity to demonstrate my colour work on a model in front of a live crowd at the Colour World UK launch party at the Rush Academy in London’s Covent Gardn. 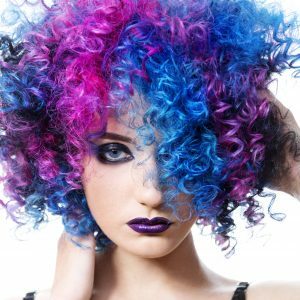 This came about when online and live events community HairClubLive was giving it’s members this fantastic chance to independent hair colourists to showcase their colour work here. I was all over this, and one email later I was selected. How exciting! So off I went and I won’t lie, I was so nervous, but I kept it together presenting my ideas and colour. And you know what? It was really well received from the crowd which I was absolutely ecstatic about! But the best thing about it was that I met some very talented artists there – it was a fantastic experience. Being honest, I have to say that combining life as a salon owner with improving my own technical hairdressing skills is sometimes stressful not to mention hard work, but you know what, I wouldn’t have it any other way. 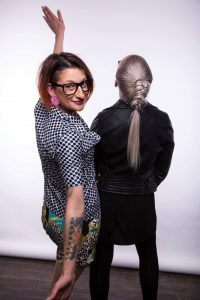 I do believe the hardest thing for me is coming from an independent salon and trying to get the mentoring and training I need to personally improve myself and at the same time taking my hairdressing to the next level. I have wrote to people in the hair industry that I look up and asked to assist for them. I’m very thankful to those who have offered me help and advice. I’m going to help assist Rick Roberts on some photo shoots later this year and I recently applied for the National Hairdressers Federation Step Up and Shine scholarship with Debbie G.
I’m also delighted to share the my Twisted Scissors salon has recently been nominated in 2 categories for the English Hair and Beauty Awards 2018, and I’m also up for Stylist of The Year, so me and my team are super excited for this. Whilst I’m unsure of which direction my own creative ideas will take me, I do know that I will continue to work hard, gain as much knowledges possible, and wherever I can keep pushing forward following my dream of being respected by my peers. I’m always willing to do voluntary work and assisting hairstylists to help me grow and nurture my skills. So if your reading this and you have a project you think I’d be suitable to help with then please don’t hesitate to send me a message HERE. I would be so grateful.